It's a tray in a hotel room, fairly unremarkable when put back to basics. The tray is littered with cigarettes, beer bottles, a can of coke, a crumpled McDonald's burger wrapper and a lonely bottle of Evian. It's a curious scene: the items on the tray are in a neat kind of disarray. Underneath this black and white photograph is the legend "Graham's hotel room, Tokyo, 1995". Meanwhile the sound of "For Tomorrow" from Blur's 1993 album Modern Life is Rubbish fills the room. The Graham in question is Blur guitarist Graham Coxon, and Blur 21: The Exhibition is another facet of the celebrations of 21 years since the band released their 1991 debut Leisure, following on from their mammoth box set also entitled Blur 21. The photos on display at the exhibition span from the band's beginning in 1990 up to 2012, featuring photos taken by acclaimed music photographers Pennie Smith and Kevin Cummins, among others. 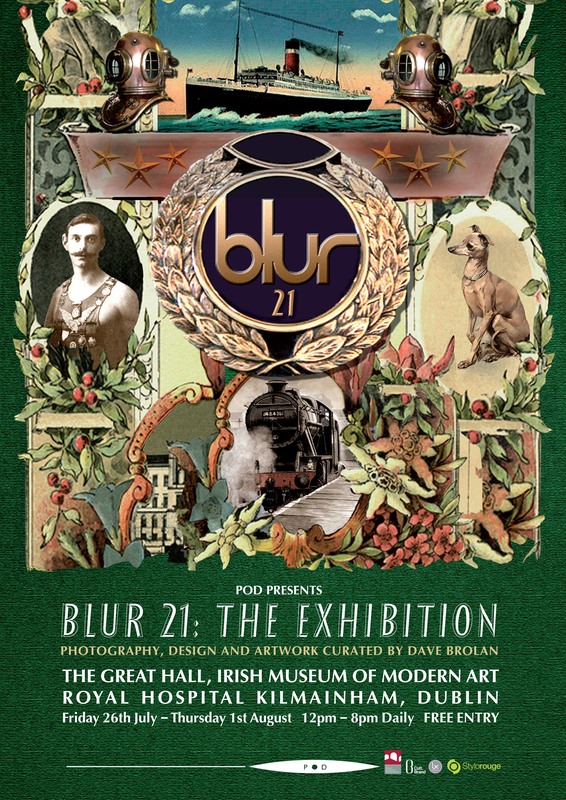 The exhibition is housed in the Irish Museum of Modern Art in the run up to Blur's performance there on 1 August. Blur as a band have always been mindful of their artwork, perhaps more so than other bands. Guitarist Graham Coxon studied art at Goldsmiths College in London, while bassist Alex James described how much he enjoyed spending time in the Tate Modern as a student in his autobiography Bit of a Blur. All of this just goes to show that IMMA is a more fitting venue for Blur than might originally have been assumed. The exhibition is like a Blur treasure trove. A large print of their iconic "British Image 1" photograph, which caused ructions when it was first taken for fear that it was xenophobic, sits in the grand fireplace. In the centre of the exhibition is a glass case displaying the different prototypes for the Blur logo (they unquestionably chose the best one) and just across from this is a series of photographs taken at Click Studios in London in 1993. The four photos, portraits of each band member taken against a striking blue background, stand out almost immediatly from the centre of the room. While Dave Rowntree, Damon Albarn and Alex James' portraits all look similar, Graham Coxon is looking downwards and as a result of this casts a sombre looking shadow around his face. It's interesting, you can see the beginning of Blur: studenty, sitting on the tube, all of them wearing a uniform of Doc Martens; the middle and unravelling of the band: Coxon appearing separately from the band, looking either disinterested or unhappy in photos with the band; to the new decade of Blur: walking around backstage at Glasontonbury, posing for group photos in Manchester, and looking so into the music they're playing that you'd almost forget that they ever even broke up. The more recent photos, taken when the band were onstage shortly after they reunited, take on a different resonance when you can see where it all began and the points where the band didn't seem to be as connected as they used to be. Fundamentally you can see that they are still the same band that got the tube home after rehearsing all night, in the recording studio that Damon worked in as a tea boy, because that was the only time they could get studio time cheaply, and that they are still comprised of the same bassist and guitarist who lived in a squat in New Cross because they couldn't afford to pay rent. The band look happiest in the photos where they're playing live, and it's the capturing of these changes in the life of Blur as band that make these images so significant.